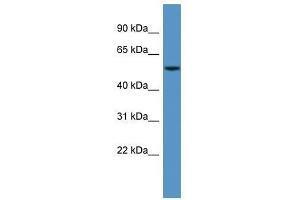 Western Blot showing CYP3A5 antibody used at a concentration of 1-2 ug/ml to detect its target protein. Background This gene,CYP3A5, encodes a member of the cytochrome P450 superfamily of enzymes. The cytochrome P450 proteins are monooxygenases which catalyze many reactions involved in drug metabolism and synthesis of cholesterol, steroids and other lipids. This protein localizes to the endoplasmic reticulum and its expression is induced by glucocorticoids and some pharmacological agents. The enzyme metabolizes drugs such as nifedipine and cyclosporine as well as the steroid hormones testosterone, progesterone and androstenedione. This gene is part of a cluster of cytochrome P450 genes on chromosome 7q21.1. This cluster includes a pseudogene, CYP3A5P1, which is very similar to CYP3A5. This similarity has caused some difficulty in determining whether cloned sequences represent the gene or the pseudogene. Multiple alternatively spliced transcript variants have been identified for this gene. Synonyms: Polyclonal CYP3A5 antibody, Anti-CYP3A5 antibody, cytochrome P450, family 3, subfamily A, polypeptide 5 antibody, CP35 antibody, P450PCN3 antibody, PCN3 antibody.